The majority of home solar installations are rooftop mounted panels. Roofs offer a practical and ready location to install solar cells on most occasions. But on some occasions the rooftop is just not suitable, or optimal. 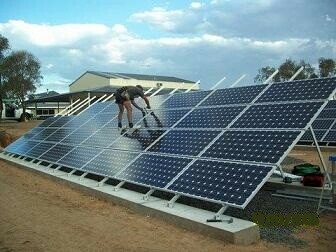 In this situation the alternative is to have your solar PV system mounted on the ground. This article will outline what, why and the pros and cons of ground mounted solar PV installations. What is a ground mounted installation? 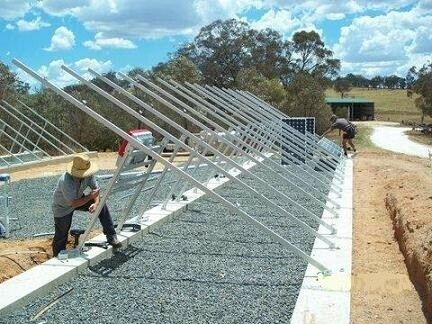 In a ground installation a frame is built for your solar cells that tilts them up to an optimal angle (usually 30 degrees) and faces the correct way (North in Australia). The frame can be built out of galvanised steel or aluminum, and is attached to the ground via a concrete foundation. In many cases the frame will be a rigid half A frame like structure. Where achieving the maximum possible efficiency is an aim (such as in commercial or very large installations) it is possible to have half A-frames that are manually tilt adjustable, so that in winter when the sun is lower in the sky the cells can be tilted up for greater exposure. Sun tracking installations are also available (where the cells rotate slightly throughout the day to follow the sun) and these are generally mounted on a vertical pole or beam (like a lamppost) to allow rotation. Why would you ground mount your solar PV system? Depending on your circumstances a ground mounted installation may more suitable for you. If you would like to receive further advice on what installation suits your needs best, please contact one of our sales consultants. 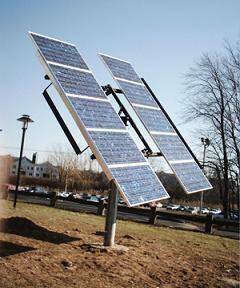 I am planning to erect a ground-mounted array of 185W panels, and I have located a fixed frame supplier (Arrid). The design offered by this company is a fixed tilt (25 deg.). I asked for an adustable frame so that I can manually set the angle twice a year (say). Do you know of a company which supplies adjustable tilt frames?